Missing and Murdered Aboriginal Women and Girls in British Columbia and Canada. 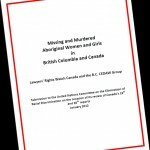 Submission to the United Nations Committee on the Elimination of Racial Discrimination on the occasion of its review of Canada’s 19th and 20th reports, January 2012, by Lawyers’ Rights Watch Canada and the B.C. CEDAW Group.